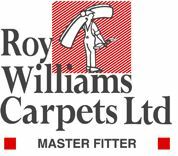 Roy Williams Carpets Ltd - Carpets/Flooring based in Long Ditton, Surrey. You will receive the benefit of our experience of over 30 years. Surrey and South London areas covered for free estimates. Surbiton, Thames Ditton, Chessington, West Molesey, West Byfleet, Kingston, Teddington, Twickenham, Hampton, New Malden, Raynes Park, Epsom, Sunbury, Staines and the whole of Surrey.